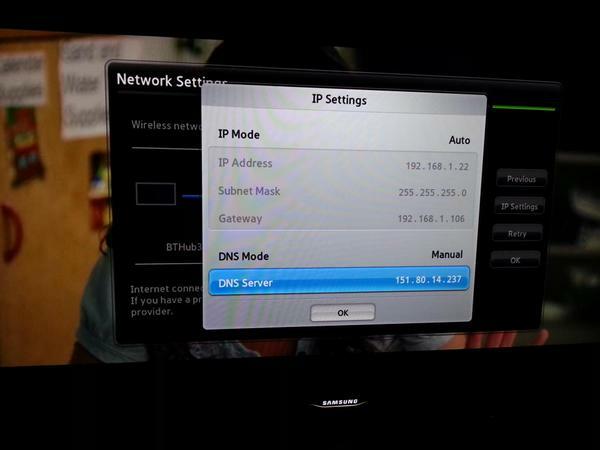 By modifying the DNS server settings of Samsung Smart TVs, the SmartHub works again. Samsung’s Smart TV platform has been down for at least a day now. Currently two temporarily workarounds are known, one is as simple as changing an IP address in the TV settings, the other requires some technical knowhow. We’ve received several reports that these settings work and solve the issue. The downtime of Samsung’s Smart TV platform appears to be caused by a failing Smart Hub server update. Samsung’s Smart TV platform has been down for more than a day, making it impossible for users to use popular apps like Netflix and HBO. Another major outage in April last year was caused by a fire in a Samsung datacenter and also affected Samsung smartphones. From that incident we already learned that all TVs connect to a Samsung server and when that is down, the Samsung Smart TV platform is also down for all users. In this case some users report that the TV indeed fails to connect to a Samsung server, allegedly due to a Domain Name Server (DNS) failure. The above methods are workarounds to bypass the failing server. Update: The outage appears to be resolving now. More and more users are reporting their Smart TV works as intended. There still has not been an official statement from Samsung on the cause of the outage. Update 2: User Kmaru who was so friendly to setup a VM for method 1 has informed us that he has taken down his solution. So this can’t be used anymore!